We are experts in garage door repairs but we also offer gate repair services. Our mission is to keep all our customers satisfied with their safe and secure gates that are designed to offer convenience. We know that broken gates can put your safety and security at risk. This is why we aim to complete each job as fast as we can without compromising the quality of the job. Our technicians are highly trained, so they understand a wide range of gate systems and are available when it really is an emergency. We take pride in our experience and training. This is what we're committed to providing topnotch repair services. We are capable of servicing slide, swing, and rolling gates. 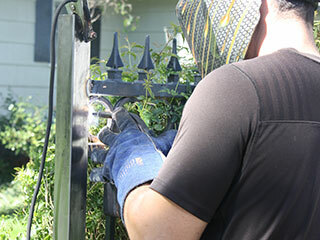 We can troubleshoot a wide range of issues and we also install gates, openers, and entry systems. Like most electro-mechanical systems, gates require regular maintenance to ensure they live as long as they should do. By scheduling routine visits with us, you can rest safe in the knowledge that your system is as lubricated as it should be and that any early signs of wear and tear are caught early. Maintenance is all about catching problems before they snowball into larger issues that are far more costly to deal with. We can look after all your phone entering and intercom services, whether you're looking to have a new system installed or an existing one upgraded. We work with a number of popular brands such as 'Aiphone' and 'Linear' to ensure all your safety and security needs are met. Repairs do not have to be expensive. With our affordable rates, you will find that gate repair and servicing does not have to be a burden. It is our goal to serve you by considering not just your needs but your budget as well. From installation, parts repair and replacement, we keep our prices affordable without compromising the quality of work. Contact our experts today at Garage Door Repair Escondido to arrange an appointment.